Our new school year is about to begin. Though my children and I will spend most of our time working on school activities from the comfort of home, we travel to at least six different supplemental classes and private lessons each week. And once we arrive at the the destination, at least one child has to wait for her sister to finish the class or lesson. If a lesson is short (30 to 45 minutes), children who are waiting will read books, watch a short educational DVD, play a portable non-electronic game, or run around outside. But a couple of times each week, the older girls have private lessons that last two hours. When I add in travel time to and from our house, that’s a little more than six hours of waiting time. I definitely want to put those minutes to good use! In order to use our time wisely, we take our homeschool on the road. Though it may seem problematic, schooling on the road doesn’t have to be a challenge. As long as my children bring their books and assignment sheets along for the ride and I keep a stash of carschooling materials inside our van, we can get a significant amount of work done while away from home. While waiting, we’ll sometimes school in a quiet location in the instructor’s home or find an empty room in the building and work there. If a library is nearby, we’ll school there while we wait. If no suitable work space is available, we’ll school inside our van. We carry our basic homeschool supplies with us in the van, so no matter where we are, we are ready to homeschool. In order to make homeschooling away from home work, it’s important to be prepared. In the video below, I show you how I prepare our van for carschooling. In this “trunk tour”, I show you what I carry in the van and explain how I organize everything for easy accessibility. 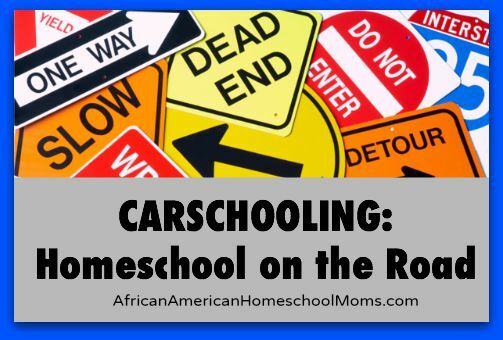 For even more tips on carschooling, check out 9 Tips for Homeschooling on the Go, a related post on my personal blog. Thanks for visiting. The Facebook group is quite active and I’m sorry you weren’t able to access the group. 🙂 If you click the Facebook Like box in the right sidebar, you should be taken directly to the group. I tried it this morning and it seemed to be working. If you’re still unable to access the group, you can send me an email by clicking the contact bar in the top menu. Have a great day!